Most people living in the Christian world have heard it said that the world is about 6,000 years old. Many go so far as to say that the entire universe is only 6,000 years old. As we have discussed, this belief is not founded on a correct reading of the Jewish and Christian sacred texts. The globe God reorganized was already present in the universe. Scripture tells us that it became chaos and lifeless, which implies that when originally created, our globe was neither chaotic nor lifeless. It also implies that it became disorganized and lifeless because something happened in the universe that damaged it throughout. “We know that the whole creation has been groaning,” said the Apostle Paul (Romans 8:22). Why would the universe be in a state of groaning? It is apparently because no place in the universe is untouched by the ill effects of sin. Indeed, Scripture tells us that the works of God are perfect: “your works are wonderful, I know that full well,” said the Psalmist (Psalm 139:14). Sometime in past millennia, God brought healing to a small planet of the universe in particular distress. He reorganized it and placed plant, animal and human life upon it. But this did not happen 6000 years ago as countless theologians would like us to believe, it happened thousands of years ago, and it is not possible to know for sure the exact timing of this astounding event. How can we be sure that the “Creation Event” took place more than 6,000 years ago? And, why are Christians and Jews so persuaded that it happened nearly 6,000 years ago? According to the Jewish Calendar, we are currently in the Hebrew Year 5776 since Creation. Usher, whose chronology the majority of Christians support, also calculated it on the basis of the same Masoretic texts. He claims that the world was created in 4,004 BCE. This means that for most Christians the world is currently in the year 6,019 since Creation. There is a 243 years gap between Usher’s Christian calendar and the Jewish calendar. In reality, neither calculation is correct. The Hebrews texts used by the Masoretes shortly before the end of the first millennium of the Common Era had already been altered to fit Jewish interpretations of prophetic timelines. This is a long story we cannot take the time to discuss here. A much more ancient text was used to translate the Septuagint from Hebrew sacred texts into Greek about two centuries before the Common Era. Though also altered, these Hebrew documents translated into Greek fail to agree with the Masoretic timeline. Let me introduce the reader to two graphs I have created to show the difference between the two timelines. Let us consider the differences in timing they suggest. Both of these charts begin with the Flood of Noah. They show the successive patriarchs that followed the Flood to the time of Abraham. The vertical lines represent the lifespan of Abraham. As can be seen, according to the Masoretic text, Abraham was born during the lifetime of all the eleven patriarchs that preceded him. In fact, three of them outlived him, Shem, the son of Noah, Salah and Eber. When considering the timeline suggested by the Septuagint, Abraham knew his father and may have known his grand father for a short period of time, as most people would. One of the two timelines appears far more plausible than the other. Indeed, according to the Masoretic timeline, Abraham died within the first five centuries after the flood. When considering the Septuagint, he died nearly 1500 years after the Flood. This chart looks far more plausible than does the Masoretic timing from which the 6,000 years since Creation has been calculated. Why is this important to the subject at hand? The chart most Judeo-Christians have adopted is obviously flawed for a number of reasons we shall consider later. 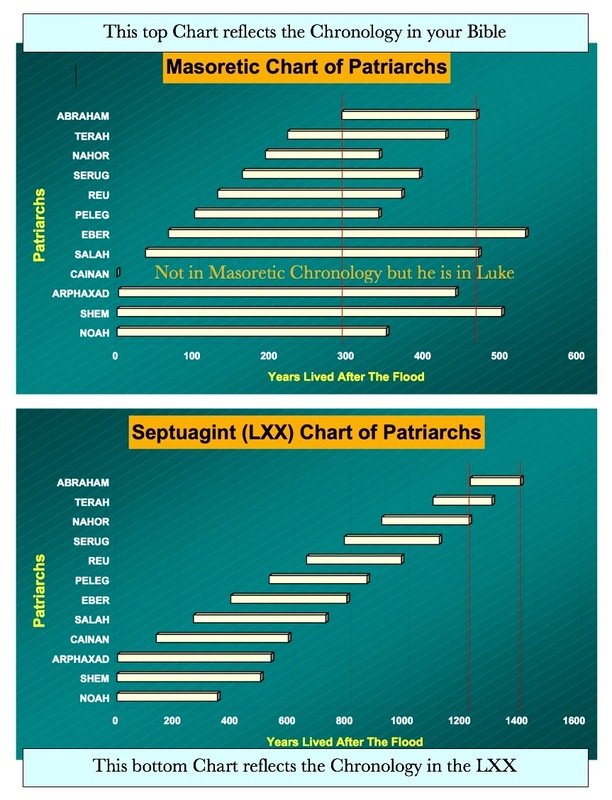 If correct, the Septuagint Chart would add at least one thousand years to the traditional Jewish calendar, and the same timeframe to Usher’s chronology. This fact alone makes it very clear that Creation would have taken place more than 6,000 years ago. How can such discrepancies of data be expected to agree with Science? The civilizations of the past 5,000 years are fairly well established. Carbon 14 dating and other scientific dating methods generally agrees with the Septuagint chart. It clearly suggests that Creation took place much sooner than most Jewish and Christian theologians claim. If religion cannot agree with itself, how can it be expected to agree with Science? The problem is that the same thing could be said about science. More often than most people realize, science also fails to agree with itself on a host of subjects. Global warming comes to mind, but dating is also far from a perfect science. What is important in Scripture is not the details of timing through millennia, it is the message of love God has been trying to communicate to humanity. Let us listen to the message, and let us forget the details of the timeframe; it may well be totally irrelevant to the growth of divine love in the human heart.